As part of an on-going project to formally document the presence of Pomacea paludosa (Say, 1829) [Florida Applesnail] in northeast Florida, this reporter conducted a visit to a small creek which flows southwesterly under Philips Highway (US Route 1) in the 12000 block and just northwest of Bayard/St. Augustine Road. 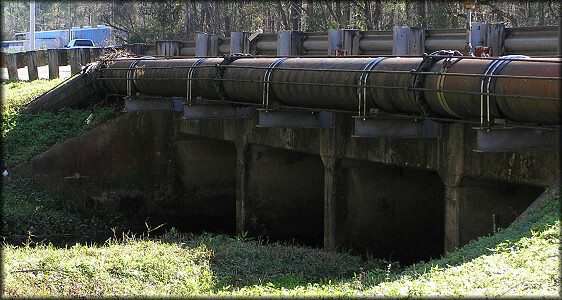 This waterway is depicted on topographic maps as "Big Davis Creek" - a tributary of Julington Creek which ultimately flows into the St. Johns River. 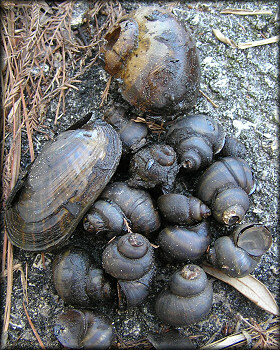 Immediately upon arrival at the site on February 1, 2006, evidence of snail activity was apparent. A few Pomacea egg clutches were found on the concrete box culvert which runs underneath Philips Highway, but no live or dead specimens could be located despite an thorough search of the creek bank. Attempts to dredge the creek bottom for specimens proved futile, as, despite the fact that the creek was only about 10 feet wide, the bottom could not be reached with the 13 foot long collecting apparatus. Ultimately a shallower spot adjacent to Philips Highway was located and a single Pomacea paludosa shell was obtained. It appears likely that once temperatures warm and the species again becomes active, live specimens will be found. Despite the dearth of Pomacea a large number of live Campeloma floridense (Call, 1886) Purple-throat Campeloma and Viviparus georgianus (I. Lea, 1834) Banded Mysterysnail were easily collected as well as a pair of Villosa vibex (Conrad, 1834) Southern Rainbow. The area was revisited on May 17, 2006 and several freshly deposited egg clutches were observed in the immediate area of the bridge thus confirming that a viable breeding population of Pomacea is still present. However, as during previous visits, no specimens could be located. Also see: Big Davis Creek At Interstate-95.